Discover out-of-the-way places like Bongaree Beach and Woorim Beach. 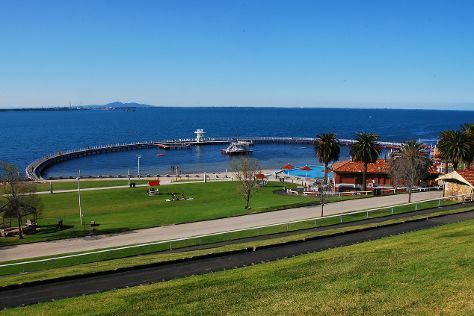 Relax by the water at Sylvan Beach and Red Beach. To find traveler tips, maps, ratings, and tourist information, use the Bribie Island tour planner . Townsville to Bribie Island is an approximately 5.5-hour flight. Expect slightly colder temperatures when traveling from Townsville in December; daily highs in Bribie Island reach 32°C and lows reach 23°C. Cap off your sightseeing on the 17th (Mon) early enough to travel to Bendigo. Get outdoors at Salute Olivia and Terrick Terrick National Park. You'll explore the less-touristy side of things at Simply Tomatoes and Mount Ida Lookout. Explore Bendigo's surroundings by going to Echuca (Port of Echuca Discovery Centre & The Great Aussie Beer Shed), Castlemaine Diggings National Heritage Park (in Chewton) and Mount Tarrengower Lookout (in Maldon). There's much more to do: contemplate the waterfront views at Cairn Curran Reservoir, examine the collection at Golden Dragon Museum, admire the striking features of Sacred Heart Cathedral, and sample the fine beverages at Henry of Harcourt. To see other places to visit, more things to do, where to stay, and other tourist information, go to the Bendigo road trip app . Use the Route module to find suitable travel options from Bribie Island to Bendigo. Wrap up your sightseeing on the 24th (Mon) early enough to drive to Ballarat. Eschew the tourist crowds and head to Sailors Falls & Mineral Springs and St George's Lake. 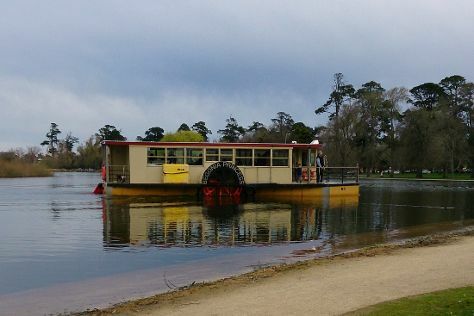 Visiting Lake Wendouree and Lake Daylesford will get you outdoors. Explore Ballarat's surroundings by going to Hepburn Springs (Hepburn Springs Golf Club & Mount Franklin), Daylesford (The Mill Markets, Convent Gallery, & more) and Overwrought Garden Art (in Blampied). There's much more to do: admire the striking features of Ballarat Railway Station, admire the natural beauty at Ballarat Botanical Gardens, look for all kinds of wild species at Ballarat Wildlife Park, and let little ones run wild at Lake Wendouree Adventure Playground. To see traveler tips, photos, more things to do, and other tourist information, refer to the Ballarat day trip planning site . You can drive from Bendigo to Ballarat in 1.5 hours. Alternatively, you can take a bus; or take a train. In December, daily temperatures in Ballarat can reach 29°C, while at night they dip to 13°C. Wrap up your sightseeing on the 29th (Sat) early enough to drive to Halls Gap. Take a break from the city and head to Grampians Adventure Golf and MacKenzie Falls. Eschew the tourist crowds and head to MacKenzie Falls and Little Desert National Park. Get out of town with these interesting Halls Gap side-trips: Ngamadjidj Shelter (in Laharum), Mount Arapiles-Tooan State Park (in Natimuk) and Dunkeld (The Picaninny (Bainggug) & Mount Abrupt). 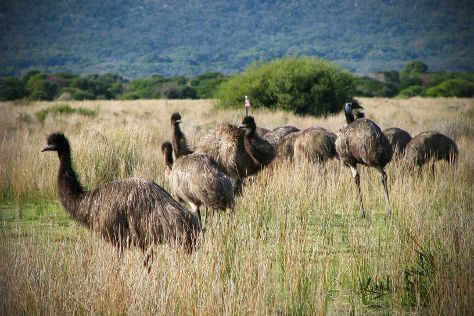 Spend the 31st (Mon) exploring nature at Grampians National Park. There's lots more to do: take some stellar pictures from Boroka Lookout, trek along Grampians Peaks Trail, take in the dramatic scenery at Burrong Falls, and admire nature's wide array of creatures at Halls Gap Zoo. To find other places to visit, maps, photos, and other tourist information, read our Halls Gap trip planner. Traveling by car from Ballarat to Halls Gap takes 2 hours. Alternatively, you can do a combination of train and bus; or take a bus. Wrap up your sightseeing on the 5th (Sat) to allow time to drive to Port Campbell. Port Campbell is a coastal town in Victoria, Australia. You'll explore the less-touristy side of things at Apostle Whey Cheese and Gibsons Steps. Visiting Johanna Beach and Thunder point Coastal Reserve will get you outdoors. You'll find plenty of places to visit near Port Campbell: Griffiths Island (in Port Fairy), Otway Fly Treetop Adventures (in Weeaproinah) and Warrnambool (Tower Hill Wildlife Reserve, Flagstaff Hill Maritime Village, & more). Spend the 6th (Sun) exploring nature at Port Campbell National Park. There's much more to do: don't miss a visit to The Grotto, identify plant and animal life at Loch Ard Gorge, contemplate the waterfront views at Bay of Islands, and take in the dramatic natural features at The Razorback. 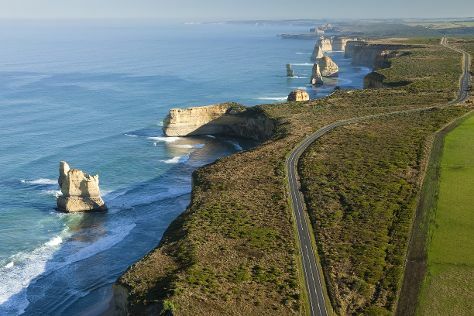 To find where to stay, traveler tips, and more tourist information, refer to the Port Campbell road trip planning website . You can drive from Halls Gap to Port Campbell in 3 hours. Alternatively, you can take a bus. Wrap up your sightseeing on the 11th (Fri) to allow time to drive to Lorne. Lorne is a seaside town on Louttit Bay in Victoria, Australia. Relax by the water at Torquay Front Beach and Bells Beach. Step out of the city life by going to Stevensons Falls and Great Ocean Walk. Explore the numerous day-trip ideas around Lorne: Eastern Beach Reserve (in Geelong) and Apollo Bay (Mait's Rest & Karmic Goat Soapworks). Make the 15th (Tue) an awe-inspiring day at Lorne Beach. Make the 17th (Thu) an awe-inspiring day at Won Wondah & Henderson Falls. It doesn't end there: take in the dramatic scenery at Erskine Falls and don't miss a visit to Teddy's Lookout. For ratings, where to stay, photos, and tourist information, read Lorne day trip site . Traveling by car from Port Campbell to Lorne takes 2 hours. Alternatively, you can take a bus. In January, daytime highs in Lorne are 30°C, while nighttime lows are 16°C. Wrap up your sightseeing on the 17th (Thu) to allow time to travel to Rye. Rye is a seaside resort town, approximately 83 km south of Melbourne, Victoria, Australia, on the Mornington Peninsula, Victoria, Australia. Visit Sorrento Back Beach and 13th Beach for some beach relaxation. Discover out-of-the-way places like Portsea Back Beach and Gunnamatta Beach. Explore the numerous day-trip ideas around Rye: Point Lonsdale Lighthouse (in Point Lonsdale), Somers Beach (in Somers) and Point Nepean National Park (in Portsea). There's much more to do: enjoy the sand and surf at McCrae Beach, take in nature's colorful creations at The Enchanted Adventure Garden, stroll through Pearses Beach, and identify plant and animal life at Pulpit Rock. To see other places to visit, photos, reviews, and other tourist information, you can read our Rye driving holiday planner . You can do a combination of car and ferry from Lorne to Rye in 2.5 hours. Other options are to do a combination of bus, ferry, and taxi; or do a combination of bus and train. In January in Rye, expect temperatures between 30°C during the day and 16°C at night. Finish up your sightseeing early on the 23rd (Wed) so you can travel to Balook. You'll discover tucked-away gems like Mt Oberon Summit Walk and Reeeves Beach. You'll get in some beach time at Squeaky Beach and Little Waterloo Bay. Change things up with these side-trips from Balook: Wilsons Promontory National Park (Wilsons Promontory National Park, Norman Beach, & more), Toora (Toora Wind Farm & Great Southern Rail Trail) and Woodside Beach (in Woodside). For photos, where to stay, traveler tips, and tourist information, read our Balook trip planner. You can drive from Rye to Balook in 3 hours. In January, plan for daily highs up to 30°C, and evening lows to 15°C. Cap off your sightseeing on the 31st (Thu) early enough to travel back home.